HMRI hosts and facilities a wide range of research seminars, workshops, training sessions, trade displays and events to support the work of Hunter researchers. The preeminent event is the HMRI Seminar Series - featuring national and international research and industry leaders at HMRI. The HMRI Communications Team also supports other research seminars with facilities, marketing and promotion. If you would like more information about upcoming research events in the Hunter, please contact the Communications Team using the form below. The HMRI Seminar Series is a free event to encourage education and access to high-level national and international research leaders. The Series provides researchers with a regular opportunity to hear from prestigious, high-status presenters, who are invited to share their unique perspectives on health and medical research. 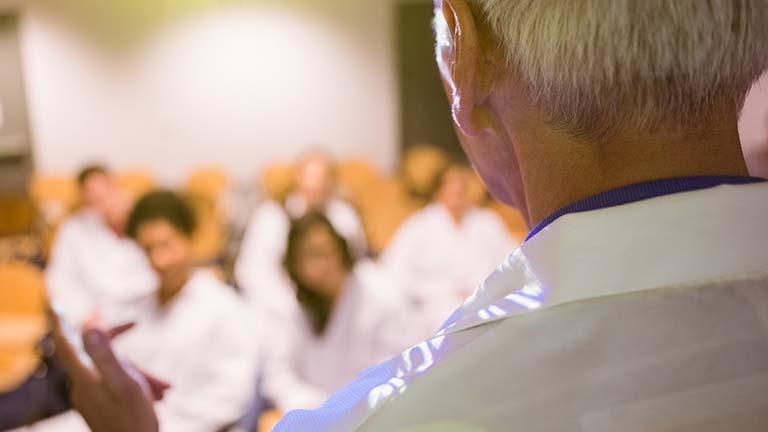 HMRI Seminar Series presenters are distinguished researchers and industry leaders, and deliver seminars with broad appeal across a wide range of disciplines and clinical focuses. The HMRI Seminar Series is a great networking opportunity for HMRI researchers, helping to foster connections with research experts from around Australia and the world, to turn these connections into opportunities for collaboration. All affiliated researchers and clinical staff are welcome and encouraged to attend.